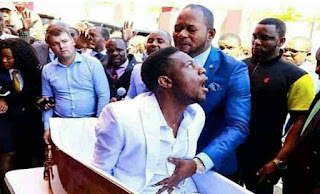 A South Africa Publication H-Metro has reported that the man who was “raised from the dead” by Pastor Alph Lukau back in February died last week. 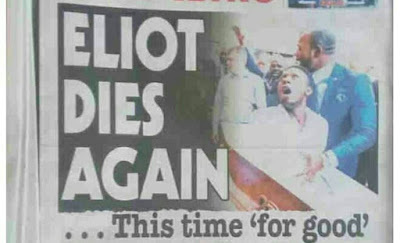 It was reported that Brighton ‘Elliot’ Moyo from Zimbabwe was allegedly raised from the dead after 3 days by Lukau. The video of the ‘resurrection’ went viral after which the pastor disclosed it was a staged miracle put up by Moyo’s family. According to reports, Brighton died last week in a village called St Luke’s in South Africa. There was no resurrection for Brighton this time as he was buried on Saturday. He is survived by his wife only as they had no children. A close family member, who revealed how Brighton died, said they noticed his stomach started swelling and didn’t stop for three days, and on the third day, he died. Meanwhile, according to other reports, when Brighton joined Lukau’s Alleluia Ministries International there were reports that he was HIV positive and he had kidney failure and he also had TB (tuberculosis). When reached for comment, officials of the church stressed that what happened in February was not a miracle.